On the blog, we’ve been talking about how to make an impact using social media ads. We looked at Facebook ads and Twitter ads. 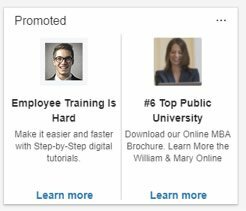 And now, we’re going to look at the top professional social network, LinkedIn. More than 500 million professionals use LinkedIn and 80% of those users have some sort of decision-making power within their organization. This makes LinkedIn one of the top platforms for reaching professional clients and customers. But like other social networks, content on LinkedIn can get lost behind social posts and memes. If you want to make an impact on this professional platform, you may need to help your brand stand out by creating effective LinkedIn ads to target leads and potential clients. #1) Assign Targeted Audiences Lists to Your LinkedIn Ads. Users who are already familiar with your brand and have visited your website. People with specific job titles who work in specific company sizes. Potential leads imported from your contacts lists. Segmentation increases your ROI by hypertargeting prospects and only showing your ads to people who are likely to convert. If you only work with medium-sized companies, there’s no point reaching out to people who work at mega corporations. #2) Determine the Best Ad Platform For Your Campaigns. Sponsored Content which promotes blog content, news, and website pages. Text Ads that serve similar functions as Facebook ads to promote your brand. Sponsored InMail which sends messages to members outside of your contact list. 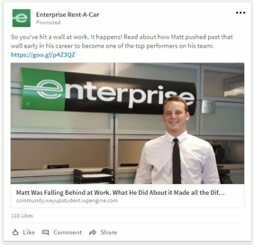 Dynamic Ads that encourage potential employees to connect with your brand. As you can see, each of these ads furthers your objectives in a different way. You might use dynamic ads to increase your talent pool when hiring or Sponsored Inmail to reach out to leads and generate sales. #3) Create a Value-Focused Campaign. LinkedIn users expect to get something from the platform. They use it to meet new people, network, and discover ways to help their businesses grow. With that in mind, make sure your LinkedIn Ads provide some sort of value proposition to your audience. 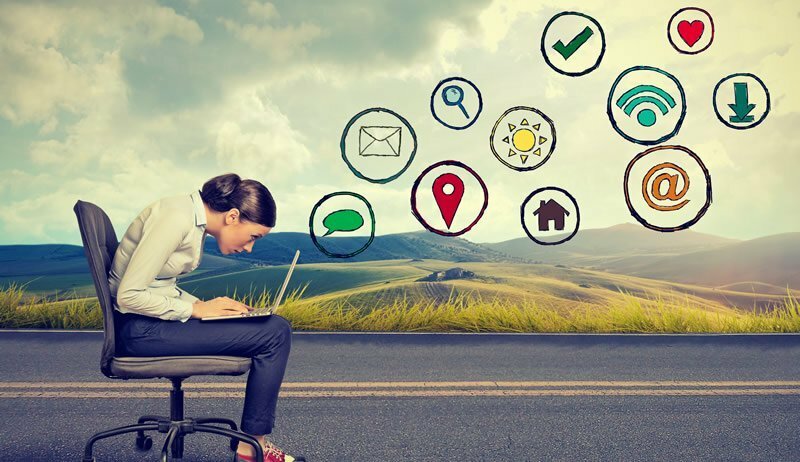 For sponsored posts, this might mean offering industry secrets or an informative webinar, while display ads might promise a fulfilling career in your organization. #4) Develop a Clear Conversion Funnel. Creating and promoting your LinkedIn Ads is only half of the work your brand will need to do to create an effective digital marketing strategy. Make sure your ads lead to relevant landing pages with a form of lead generation opportunities. This might include contact forms or sign-up boxes for your email list and webinars. You may even need to create a landing page exclusively for your LinkedIn audiences to better track the traffic. Creating a clear funnel for lead generation will allow you to see exactly how effective your LinkedIn Ads are. Without it, your audiences are likely to get lost, bounce, or ignore your brand. #5) Use Appropriate Jargon With Your Target Audiences. On LinkedIn, you have the luxury of targeting a specific audience with a specific message. So when you write your ad copy, speak directly to those readers and show them how they benefit from interacting with your brand. Don’t be vague or lean toward more generic copy, or you could target the wrong people and fail to catch the attention of industry leaders. For example, the phrase “managers wanted,” could relate to anyone from high-school assistant managers of fast-food joints to senior managers of bioengineering. Industry jargon and specifics provides clarity and better targeting for your LinkedIn ads. #6) Choose Between CPC or CPM Advertising. LinkedIn marketers can choose to pay for clicks or impressions. Those who chose the cost-per-click (CPC) model will set the maximum amount they’re willing to pay for a click. If you’re willing to pay one dollar per click, then a $200 budget will drive 200 clicks. The cost-per-impression (CPM) model requires users to pay a fee for impressions. You might pay $200 for 5,000 impressions. This might result in 20 clicks or 200, depending on your campaign success. Each brand has its own ROI goals, so testing different display options can help you see which provides the best return. 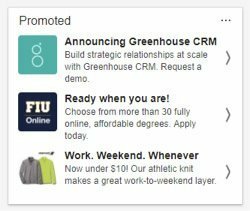 Create a Full Digital Strategy Using LinkedIn Ads. The people who use LinkedIn are often strategic-minded and goal-oriented business professionals. If you don’t approach your LinkedIn ads with the same planning and care then you might not see your desired efforts. You also need to keep in mind that LinkedIn ads are just one piece of a larger digital marketing strategy. To learn how to social media advertising into the rest of your online marketing, get our free ebook.